a 6.57 ERA, Luke? Papa doesn’t love you anymore. Maybe he never did. Let’s start with Edwin Jackson. 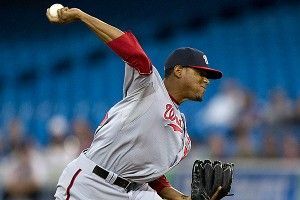 On Monday night, he faced the Toronto Blue Jays in a battle of capital cities. Unless Toronto isn’t Canada’s capital city, in which case I don’t really have an angle here. Regardless, the Blue Jays are one of the most potent offenses in the American League. They’ve scored 296 runs in a division (AL East) with a plethora of good-to-great pitchers. What did Jackson do? Eight innings, four hits, two runs. The win moved the 28-year-old Jackson to 3-3 on the season, but the record doesn’t tell the full story. His ERA after 12 starts is 3.02, on pace to be his lowest ever in a full season. His FIP (fielding-independent pitching, a metric used to assess a pitcher’s overall effectiveness) is in the National League’s top 30. His walk rate and home run rate are lower than they’ve ever been (again, using full-season stats), and his 16 percent line drive rate is sixth-lowest in the league, and also the lowest of his career. You get the point. There’s no way the Nationals could have expected this when they signed Jackson to a one-year deal in February. But here’s the crazy part: He is their fourth starter. Do I even need to tell you about Gio Gonzalez and Stephen Strasburg, arguably the most dynamic Washington duo since Mondale-Ferraro fever swept the District in ’84? Fine. Here’s where they rank in the following categories in the National League (Gonzalez first, Strasburg second). They are, by far, the best 1-2 punch in the game, and they showed how good they were this weekend by dominating the Red Sox in a three-game series sweep in Fenway. But remember how I said Jackson was the fourth starter? Yeah, there’s another guy. Meet Jordan Zimmermann, and please note the two ns at the end of his name so you don’t confuse him with this guy. Double-N (Dublin? Possible nickname? Too big a stretch?) was the franchise’s hottest prospect back in 2009, but elbow problems led him to the land of Tommy John. He returned to some success in 2010, and recovered nicely in his first full season back in 2011, accumulating a 3.18 ERA over 161.1 IP. Did you know there was a thing called an immaculate inning? It’s when a pitcher retires the side on nine straight strikes (three strikeouts), and it’s happened 43 times in MLB history. Anyway, Zimmermann did it last season. In 2012, he’s off to an even better start. After 12 games, his ERA is 2.91, and he was the third leg of the Red Sox sweep this past weekend, giving up three runs and striking out seven over seven strong innings on Sunday. The condensed version of all these stats: When you face the Nationals, there’s an 80 percent chance that their starter’s ERA will be 3.02 or less. Also, there’s a 40 percent chance you’ll be facing one of the top three starters in the league. Fun. But at least their bullpen probably stinks, right? WRONG. Why would you assume that, hypothetical stupid reader? The ‘pen ERA is 3.12, the fourth-lowest in the NL. Tyler Clippard, the former setup man who took the closer reins earlier this season, is now 8-8 in save opportunities with 8.1 scoreless innings. Drew Storen, who had a great season as the closer last year, is on his way back from injury. Sean Burnett has a 0.92 ERA in 19.1 innings. Craig Stammen has pitched 30 innings and notched a 1.80 ERA. Tom Gorzelanny (30.1 IP, 3.26 ERA) has also been effective, and Ryan Mattheus (20 IP, 2.25 ERA) is expected to return from injury soon. Everywhere you look, as long as you only look at the mound, the Nationals are stacked. It’s no surprise that they’ve allowed the fewest runs in baseball (194), and, barring an injury barrage or a total offensive meltdown, it’s hard to imagine a scenario where they don’t make the playoffs. Once there, is there a more terrifying opponent anywhere? They’ve got 2010 Giants written all over them; great staff, great bullpen, and just enough offense to eke out wins. And I say it’s unfair. Break up the Nationals, and give folks like Luke Hochevar a fighting chance. Isn’t this league supposed to be about the kids?